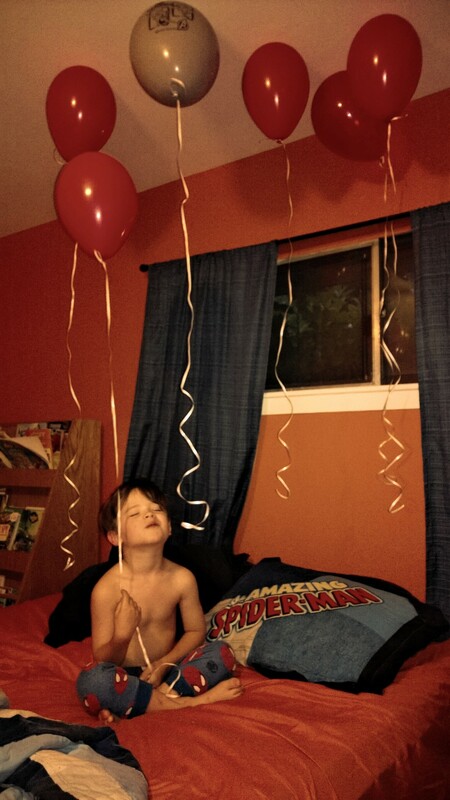 He woke up to laughter and balloons above his bed, dressed quickly, then worried as I cautioned him that we may be late for school, only for me to make a sudden left before our usual turn for the doughnut shop. With chocolate milk in hand, he closed his eyes, made a wish, and blew out his candles on a strawberry iced doughnut with sprinkles. This, all before the school day began. When I picked him up early, his classmates sang him the birthday song, along with “Cha! Cha! Cha!s” and smeared cupcake icing on their faces-much to his teacher’s dismay. We headed straight for the movies as he opened his present from me: a book and a game, both revolved around his self-professed future occupation, architecture. Tobias’ birthday reminded me of how things have changed in his years here on earth. He came into this world the child of a marijuana-dealing-by-day, line-cook-by-night father, and a lost, teenage and broken mother. I remember that first night that I held him in my arms–my tired family had all run to IHOP for a celebratory meal–I assume his dad was with them, or somewhere off lighting a joint near hospital grounds. He left to do just that while I was in labor-the same thing he did in the middle of our wedding reception. It was all very typical. I held Tobias in front of me, looking at his pale face with his top eyelids kissing their bottoms. An overwhelming sense of loneliness washed over me in that moment, and I realized that this is just as things were going to be going forward. Me and him, and I’d figure it out. Just the two of us. Fast forward six years. SIX WHOLE YEARS, a lot of moving into different places to live, one home, a handful of different jobs, two universities, one graduation, one career, a divorce, and an engagement. After all of that, I now feel like he has the stable, focused childhood that I always wanted for myself, and when it was too late, for my children. He’s in the advanced learning group at school, is confident in his abilities, participates in after school activities, and makes friends easily. He has a dad climbing the corporate ladder, a mom who is able to work from home, and an alternate life when he visits his father on weekends in the country with his maybe-soon-to-be-maybe-not stepmother, their tumultuous relationship, and a little brother. He never has to go without material possessions other than for learning’s sake, and, more importantly, he’s always surrounded with tons of love. Despite that, I can’t help but feel like I haven’t figured things out like I thought I would that night. On the outside, I have an active lifestyle, a career, a home and friends and a happy family. But I’m still so lost. And I’m still, in all honesty, very lonely. I know it comes along with being a young mom and always feeling different from your peers–or rather, unsure of who your peers are anymore. It also comes with working from home: it’s just as much work to get out and be in the company of others when you’re not crammed into an office with people every day. This struggle with balance doesn’t seem to ever let up, and I’m learning it probably isn’t just me who feels this way. In this six years, I’ve realized that the whole “figure-it-out” thing is something that I was too young at the time to put into real perspective–similar to how I thought that my ex husband’s marijuana selling was a sign of entrepreneurship, and I somehow had decided he would have translatable skills in the long run. (Very naive. Very hopeful. Very 19.) I’ve found that “figuring it out”, when it comes to parenting, is a constant, deliberate set of actions-not a box you can check at the end of some period of time. And it’s okay, because mothers all over the world are struggling with up-and-down feelings of doubt, and they’re doing just fine too. The kids are alright–and so are their mothers. We’re kicking ourselves along the way, because we always feel like we could have been better. Next time, just ask the kids. They’ll tell you the truth: You’re the best mom in their whole world. You are smart and wise and have learned much in your years. Keep up the good work. Motherhood is the most challenging job I’ve ever been tasked with. You do your best and hope it works. I will say that I found the first child more challenging than the second. Should you choose to have another child, I think you’ll find the same. Especially given how well life seems to be now for you guys. 🙂 cheers!